The large stock market crash produced widespread panic and pushed the Chinese government to implement a range of rescue policies. Did the government intervention create value, or was it simply a redistribution of value from taxpayers to the rescued firms? If it created value, where did the value added come from? These questions are important for policymakers and investors, but have not been studied in the literature. Veronesi and Zingales (2012) provide an estimate of the costs and benefits of the Paulson plan implemented during the US financial crisis in 2008. In a recent paper, we provide a similar analysis for China (Huang et al. 2016). 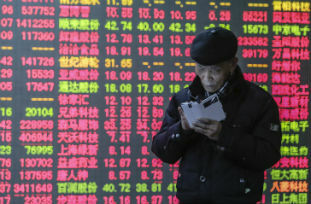 Unlike the Paulson plan, the Chinese government directly participated in stock market trading by purchasing about half of the stocks listed in the Chinese stock market. The trading was done through two state-owned corporations, China Securities Finance Corporation Limited (CSF) and China Central Huijin Investment Limited (CCH), which are known as the ‘national team’. Other institutions such as brokerages and mutual funds also participated in the intervention. Our analysis focuses on the national team due to data availability. The national team continually purchased stocks starting in July 2015, but we do not observe its daily trading behaviour. We can only observe its share holdings of the rescued firms from their quarterly balance sheets. From the balance sheets in the second and third quarters of 2015, we can infer the net purchases by the government in that period. We thus provide a short-run estimate of the costs and benefits of the government’s purchases during the period 30th June to 30th September 2015. Given the global turbulence in financial markets during the period, it is impossible to estimate the systemic effects of the government intervention. However, it is possible to estimate its effects on the rescued firms. To compute these effects on the value of the rescued firms, we do not limit ourselves to the changes in the value of common stocks, but we study the changes in the entire enterprise value by also studying changes in the value of existing debt. We first compute the actual cost of the stock purchases as the difference between the purchase cost and the holding value on 30th September 2015. The purchase cost is estimated to be the purchase prices multiplied by the number of shares purchased between 1st July and 30th September. Since we do not observe the national team’s daily trading information, we consider three estimates of the purchase prices: the lowest, the highest, and the average market prices between the two dates. Second, we compute the change in equity value using the capital asset pricing model of Sharpe (1964). We compute the abnormal returns between 1st July and 30th September of common stocks after correcting for market events. Then the change of a stock value is equal to the stock’s market capitalisation on 30th June, multiplied by the stock’s abnormal returns. Third, we compute the change in debt value using the model of Merton (1974). We use the observable equity value, the estimated equity volatility, the risk-free interest rate, and debt maturity to compute firm value and default probabilities on 30th June and 30th September 2015. We compute debt value as the difference between firm value and equity value. Since debt value also changed for non-rescued firms, we then correct the market events to compute the (adjusted) change in debt value of recued firms using non-rescued firms in the same industry as a control. Finally, we compute the costs/benefits of the government intervention as the sum of the changes in the equity value and debt value minus the actual cost of the stock purchase. 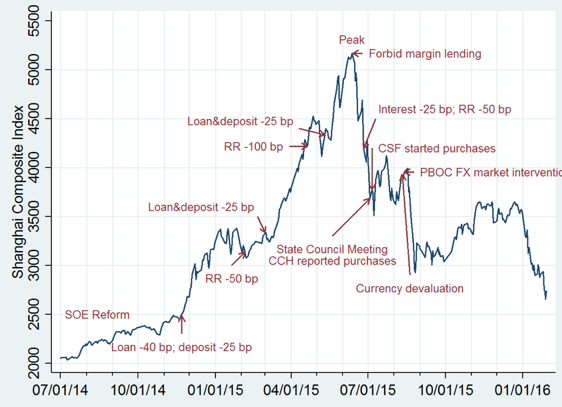 We find that the total costs of stock purchases by the national team range from RMB 770.5 billion to 1,708.8 billion. Subtracting the market value on 30th September, we find that the total actual costs of stock purchases are RMB 321.9 (average price), 818.6 (highest price), and -119.8 (lowest price). The change in equity value of all rescued firms is RMB 113 billion. The change in debt value of all rescued firms is RMB 3,169 billion. Using these values, we find that the total net gains of all purchased stocks are between RMB 2,464 and 3,402 billion. These gains are about 5% of Chinese GDP in 2014. Where does the value creation come from? Since the national team purchased more than 1,000 stocks, we have a relatively large sample to conduct a cross-sectional regression analysis. We find the following results. • First, the government purchase increased the demand for shares and raised equity value (or reduced the loss of equity value), thereby raising investors’ confidence. • Second, the government purchase reduced default probabilities of the rescued firms and hence their debt value. • Third, the government purchase raised liquidity of the rescued firms. We should emphasise that our estimates are based on a short-run analysis. Many researchers are concerned about the long-run costs of the Chinese government intervention. First, the massive stock purchases by the government prevented the efficient discovery of stock prices. The national team is a large player in the stock market, whose transactions can have a large impact on price movements. As a result, the stock prices may not reflect fundamentals. This may plant the seeds of a future bubble. Second, the Chinese government intervention can create a moral hazard problem. If firms believe that the government will rescue them if they default on the margin loans, then they may keep borrowing more without improving the loans’ profitability. Third, in addition to directly purchasing stocks, the government took some other measures such as halting IPOs, restricting short selling, and imposing a lock-up rule. These measures prevented the normal function of the stock market. Besides these possible long-run costs, there are many other questions worth further studying. For example, what are the problems of the Chinese trading system? How should one reform this system? Is there a better alternative intervention approach? We leave these questions for future research. Huang, Y, J Miao, and P Wang (2016), “Saving China’s Stock Market”, Boston University, working paper. Merton, R (1974), “On the Pricing of Corporate Debt: The Risk Structure of Interest Rates”, Journal of Finance, 29, 449-470. Sharpe, F W (1964), “Capital Asset Prices: A Theory of Market Equilibrium under Conditions of Risk”, Journal of Finance, 19, 425-442. Veronesi, P and L Zingales (2010), “Paulson’s Gift”, Journal of Financial Economics, 3, 339-368.